I hope my research can create deeper conversations and change problematic policies that infringe upon the rights of current, future, and former student athletes. It is hardly uncommon for today’s collegiate athletes to find themselves under investigation for allegedly receiving payments or perks for their performance. Yet according to research conducted by Dr. Ernest E. Cutler, Jr., it is not the athletes who should be under scrutiny, but rather their amateur status. Cutler details his research methods and results in the new book “Why Are Student Athletes Funding Your Future?" Heavily researched and conceived through multiple case studies and quantitative data, the book presents findings that scholarship shortfalls exist and student athletes are not receiving their fair share of market values. “I hope my research can create deeper conversations and change problematic policies that infringe upon the rights of current, future, and former student athletes,” Cutler said. Having coached youth and high school football for over 15 years, Cutler has firsthand knowledge of the hard work athletes put into developing their skills and how they are far from amateurs once part of a collegiate team. This coaching experience, paired with the idea that his three children may one day be eligible to play sports at the collegiate level, motivated Cutler to dig deep into the world of student athlete compensation. “I want my children, and any of the athletes I coach, to be able to maintain a comfortable lifestyle while on an amateur status if they are able to obtain a scholarship within any intercollegiate athletic level,” Cutler said. 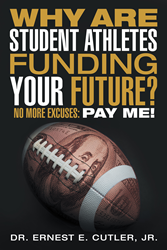 With the start of Fall sports seasons quickly approaching, “Why Are Student Athletes Funding Your Future?” will provide readers with unique insight into a debate that is sure to continue in growth. By Dr. Ernest E. Cutler, Jr.
Dr. Ernest E. Cutler, Jr. served 20 years of honorable service with the United States Navy, during which time he earned both a master’s and doctorate in Leadership and Sports Management. He currently resides in San Antonio, Texas where he works with the Department of Army and as an adjunct professor at the University of the Incarnate World.